Cass Art are proud to partner with Dulwich Picture Gallery to bring our customers an exciting ticket offer for Hockney Printmaker, currently receiving rave reviews at the Gallery. Famously known for his paintings, the exhibition explores Hockney's vast range of over 100 prints from 1954 – 2009. Focusing particularly on his etchings and lithography, Hockney, Printmaker, has been perfectly timed with the 60th anniversary of David Hockney's first ever print. Perhaps this national treasure's most well-known print work has been the illustrations within the Grimm's Fairytales storybooks of the late sixties, which are in pride of place in the exhibition. We travel through his extensive archive of prints, featuring famous sitters and friends and eventually arriving at Hockney's more experimental current work where use of photocopying, 'computer drawings' and iPad work create progressive and exciting masterpieces. Curator, Richard Lloyd, Head of Prints and Multiples at Christie's, explains that the exhibition at Dulwich Picture Gallery will provide an insight into an aspect of Hockney’s work which is often overlooked - that he is one of the most prolific, diverse and technically astute printmakers alive. He has been making prints since 1954 and throughout the subsequent 60 years he has continued to work and experiment. There’s a whole other side to Hockney, which he has devoted an enormous amount of energy and creativity to. Just 12 minutes from Central London by train lies the world's first purpose built public art gallery. Founded in 1811, Dulwich Picture Gallery houses one of the country’s finest collections of Old Masters, especially rich in French, Italian and Spanish Baroque paintings and in British portraits from Tudor times to the 19th century. Famous works include those by Rembrandt, Gainsborough, Poussin, Watteau, Canaletto, Rubens, Veronese and Murillo amongst many others. The Gallery also hosts a yearly programme of world class temporary exhibitions. Fallen in love with Printmaking? Take a look at our range of screen printing and block printing sets online and try making some Hockney inspired prints yourself. Purchase your art supplies from our online store and you'll receive an exclusive voucher for 10% off full price ticket entry to Hockney, Printmaker. We'll be including these vouchers with your art materials until the end of March and the offer can be redeemed until the 25th April. Remember to follow Cass Art on Facebook and Twitter for all the latest on offers and exhibitions. Take a look at the Dulwich Picture Gallery website for more details on the exhibition and visitor information or keep up to date on Facebook and Twitter. 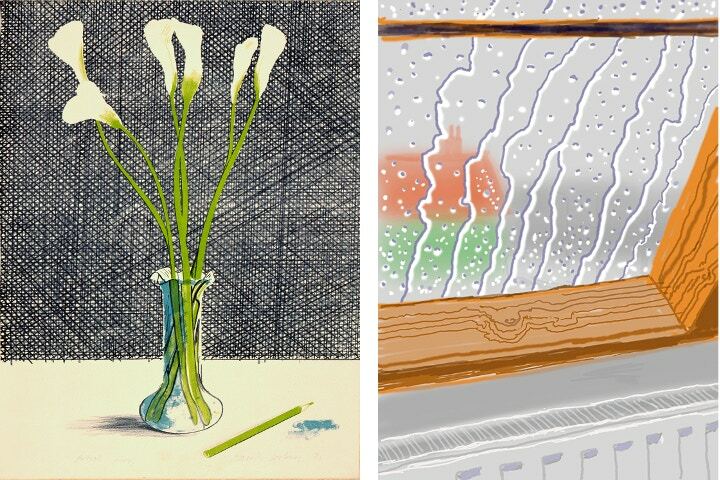 David Hockney, Rain on the Studio Window, From My Yorkshire Deluxe Edition, 2009, Inkjet printed computer drawing on paper, 22 x 17", An edition of 75, with 25 H.C.